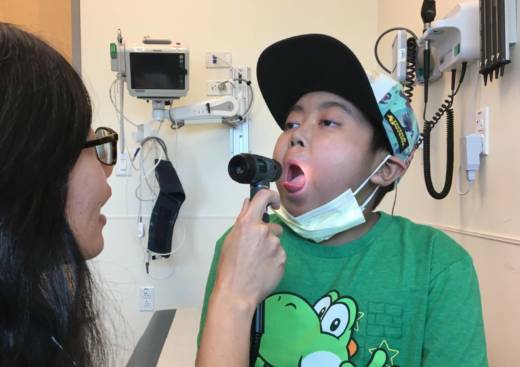 Gene Therapy Was Boy's Last Chance to Stop Leukemia. And It Worked. When Shaun Banagan hops up on the exam table in a doctor's office at UCSF Benioff Children’s Hospital his small frame barely crumples the wax paper. The shy 13-year-old has very thin arms and slight wrists. It's October, 2017, and Shaun and his family are waiting anxiously for his oncologist, Dr. Jennifer Willert, to read his latest lab results. “He’s in full remission right now without any detectable disease," Willert says. "So, he’s as negative as you can possibly get!" The small teen pulls aside his surgical face mask and smiles. Shaun is one of at least 50 children who are in remission because of a breakthrough treatment that engineers the body's own immune system to fight cancer. Last August, the U.S. Food and Drug Administration (FDA) approved the treatment -- the first accepted gene therapy in the nation -- based on the success of clinical trials like Shaun's. But Shaun's family didn’t know if this day would ever come. 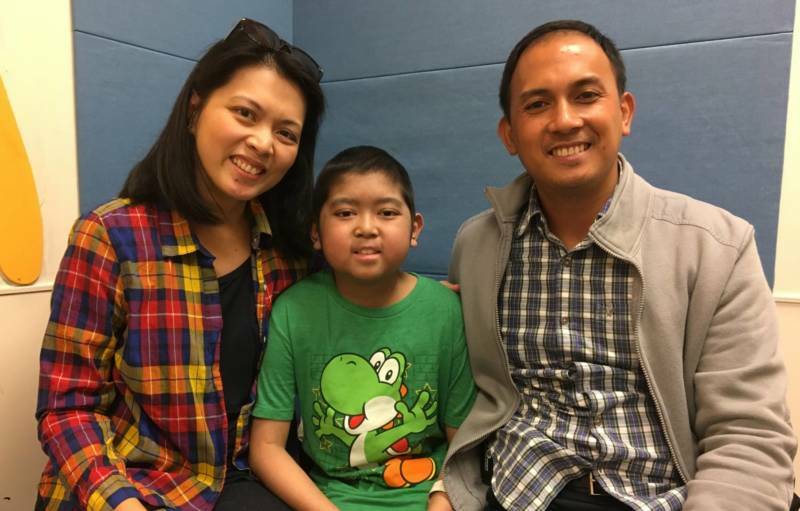 Six years ago, he was diagnosed with a form of leukemia called Acute Lymphoblastic Leukemia (ALL), which is the most common cancer in children. The National Cancer Institute estimates that about 3,100 patients under age 20 are diagnosed with ALL each year in America. Shaun started chemotherapy for the blood cancer a few weeks after his diagnosis. It was his eighth birthday. Suddenly, playing outside was off limits. Shaun's condition made him prone to bleeding. Shaun's mom, Sheila Banagan, started home schooling him -- that is, when he didn’t have fever or nausea. He spent hours day after day at the hospital, and before long he lost his hair. Then, after three-and-a-half years, Shaun’s blood tests were normal. His nurses filled the clinic with banners and balloons. They were just about to cut the cake when a doctor interrupted the party. “It just crushes your world," Sheila Banagan says. "The littlest tiniest bit of hope was taken away from me." Shaun endured a second round of intensified chemotherapy to prepare his system for a bone marrow transplant. The procedure went well, but six months later he relapsed. Dr. Willert knew there was only one possibility left. UCSF was just about to launch its first clinical trial using a breakthrough therapy. “If this had been a year or two ago we wouldn’t have had this treatment to offer him," says Willert. 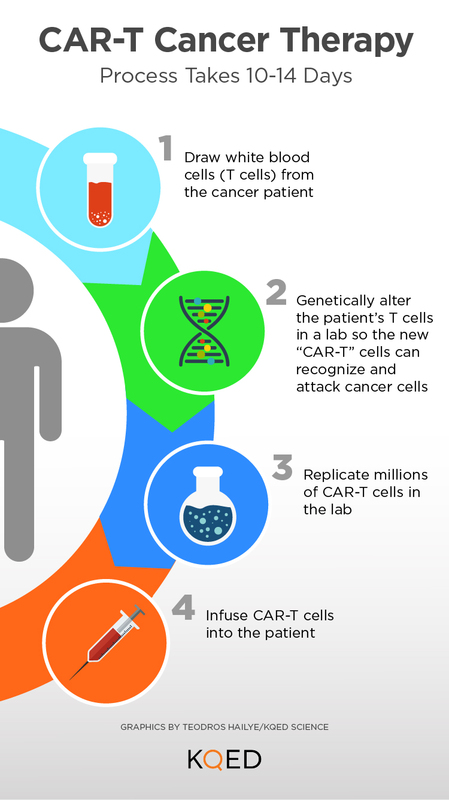 The therapy is called CAR-T-- which stands for chimeric antigen receptor (CAR) T-cell therapy -- and it's intended to super-boost the immune system. Doctors try CAR-T when everything else fails. Shaun’s medical team shipped a sample of his blood to a lab. There, scientists genetically engineered his immune cells to detect his cancer cells and destroy them. In other words, they hacked the cells. Technicians multiplied massive numbers of new cells and then sent the reprogrammed blood back to San Francisco where Shaun received an infusion. His blood was now full of virulent cancer killers. 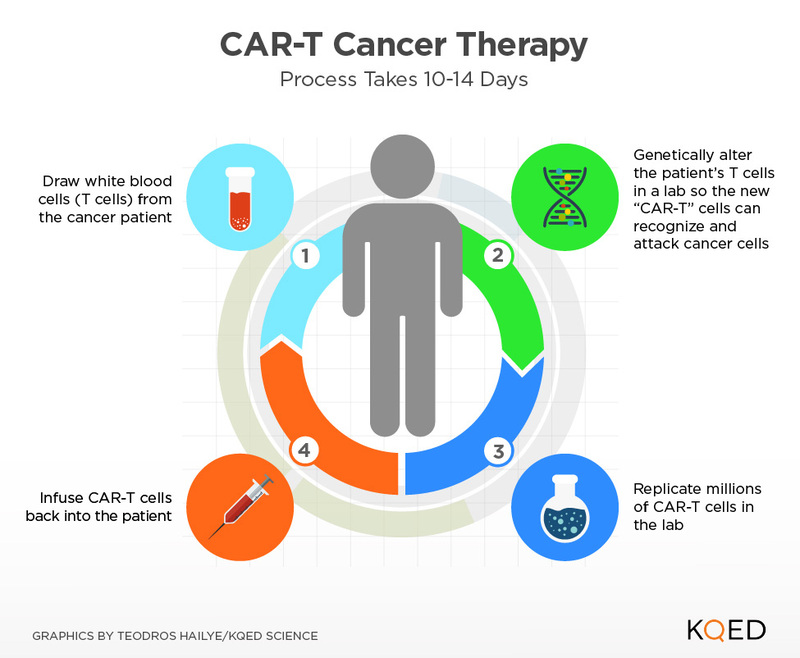 The key to CAR-T therapy is that it solves a central problem with cancer. Usually the body's immune system doesn't recognize cancer cells as foreign, and that's why they can proliferate without the body's usual defenses. CAR-T therapy is like giving the immune system glasses. "CAR-T can wake the immune system up so it recognizes cancer cells as abnormal," says Dr. Len Lichtenfeld, Deputy Chief Medical Officer for the American Cancer Society. "Then it goes after the cancer in a very real way, but that attack can sometimes be very vicious. It can cause very severe side effects." Shaun fought off high fevers and flu-like symptoms in the Intensive Care Unit for a few weeks. Lennie Sender, an oncologist at Children’s Hospital of Orange County, has dubbed the reprogrammed cells 'Frankenstein molecules' because they don't just go after cancer cells; CAR-T cells kill good immune cells too -- white blood cells called B-cells that destroy viruses and infections in the body. "You lose your B-cells," says Sender. "So, now you have to give patients monthly transfusions of replacement, and it could be for life." But the FDA is convinced the risks are worth it for some patients. A little over a month after the FDA approved CAR-t to treat Shaun's condition, the agency approved the therapy for large B-cell lymphoma. This type of lymphoma is one of several types of non-Hodgkin's lymphoma. The procedure runs about a half million dollars per patient because each treatment has to be individually engineered, but scientists hope technological advancements can change that. Some experts say CAR-T marks a watershed moment in learning how to harness the immune system to fight cancer. Thousands of clinical trials are going on right now to push the science of immunotherapy forward. "The science is exciting. The results have been spectacular for some people," says Lichtenfeld. "There's no question." He cautions, though, the science is still in early stages. "Unfortunately, for some people it has not worked. We can never forget that." A year after his CAR-T treatment, Shaun’s mom, Sheila, is grateful he's still in remission. Shaun’s life isn’t quite back to normal yet; his immune system is still too fragile for him to play outside with his brother and sister, or attend school. Shaun hopes he'll be back in class next fall.